Nuba Restaurant (web site, 1206 Seymour St., Vancouver, BC, Canada, phone: 778-371-3266, at Davie and Seymour) is a hole-in-the-wall restaurant downtown that serves delicious Lebanese food at reasonable prices. This restaurant serves many vegan and vegetarian dishes, as well as a few selections with meat. Nuba has another downtown location at 322 West Hastings (phone: 604-688-1655). I enjoyed the Najib’s Special plate (pictured below, $9.29) which featured some wonderful crispy cauliflower served with roast potatoes, hummus, salad and pita. I could have ordered rice instead of the roast potatoes, but the potatoes were a good choice. I also had the Baklava for a sweet dessert ($2.62, not pictured). We love Nuba for healthy fast well priced food. The garden falafel is really tasty with avocado and their homemade pickle. The vegetarian appetizer plate is a great sampler of all their goodies. I love the flavour of the lentil/rice/avocado dish, the crispy cauliflower is amazing and the mushrooms are great! 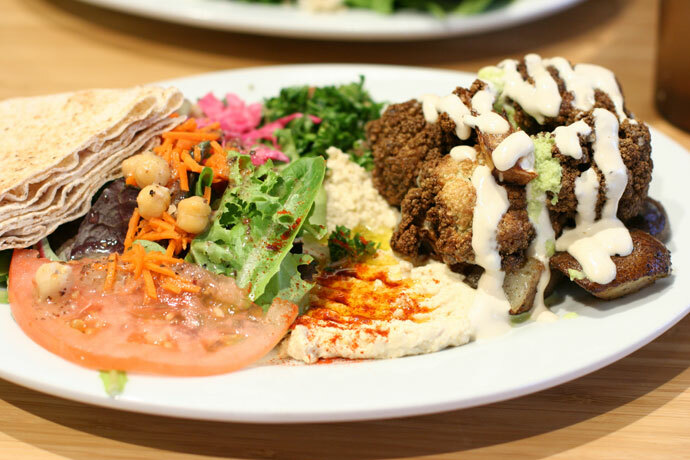 Falafel House (902 Granville Street, Vancouver, BC, phone 604-806-0045) is a fast food restaurant that serves Lebanese cuisine. 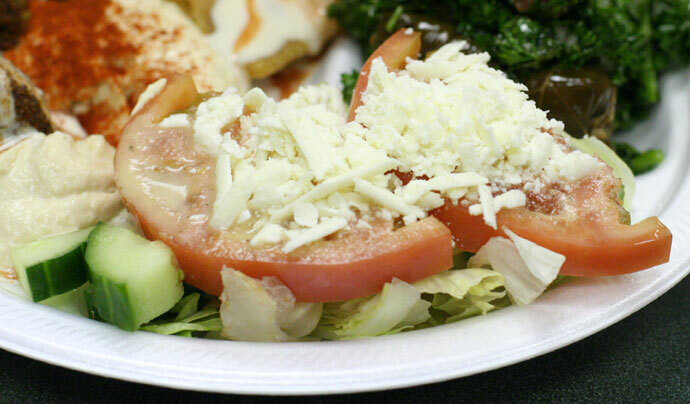 Choose from a chicken or beef donair, a chicken schwarma plate, a falafel plate, or a vegetarian plate (pictured below). The vegetarian plate comes with rice wrapped in grape leaves, a samosa, some falafel, humus and pita bread, as well as two kinds of salads. It is around $6.00 plus tax. Falafel House is big enough to seat maybe around 10 to 15 people comfortably, but is also popular for take out. The restaurant is located near the many night clubs on the Granville Strip downtown, and is open late. Update June 1st 2008: The Falafel House restaurant has changed to a pizza place, which is also open late. We hope you enjoy the great Lebanese restaurants on Dine Out Here Vancouver.